Landscapes and hardscapes require continuous maintenance. While landscapes (softscapes) require continual pruning, trimming and manicuring, hardscapes require pressure washing the fixing of cracks and the protection against invading tree roots. This becomes especially necessary when trees are in close proximity to the hardscape area, with its roots acting as powerful forces from nature which are likely to bring damage to hardscapes as well as building foundations. Roots are free forces from nature that extends underground and move outwards its tree canopy. As a tree grows, its roots also become larger as well as longer. This is a normal occurrence, but can be quite damaging in the process. As this happens, a greater amount of pressure is also applied on hard surfaces, which causes it damage. In result, this will require repair, which can be quite costly and can cause aesthetic blemishes which can be very difficult to fix. A root barrier is a product that acts as a physical underground wall designed to protect structures, like foundations and patios, against tree root damage. With the unique geotextile design of BioBarrier, the product is able to provide flexibility to surround any structure or surface. 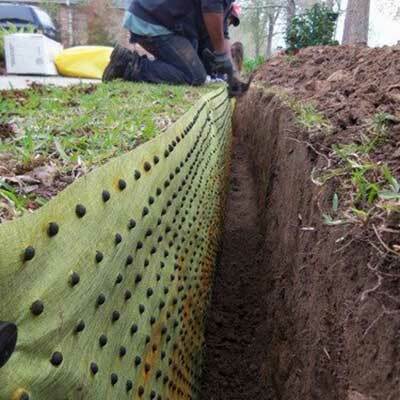 A simple application of this root barrier provides reliable protection preventing the aggressive tree roots from crossing the installed protective membrane. With this installed, not only will expenses for yearly root maintenance be eliminated, but also long-term costs concerning fracturing of the harscape surface caused by tree roots. This material is a multi-year root control system which can be installed in several ways – horizontally, vertically or simply surrounding the root itself to inhibit its growth. Typar guarantees that the product will inhibit the root growth for at least 15 years. It acts like a fabric, specifically a geotextile fabric that is flexible. The fabric features time-release nodules which are filled with herbicide that functions to prevent the occurrence of root-tip cell division without affecting the tree’s overall health. The material is porous, a characteristic that helps in allowing water, nutrients and air to pass through the fabric with ease. Roots within the zone are redirected while those that are outside are allowed to normally grow. This material has an active ingredient in the form of Trifluralin, about 17.5%. This active ingredient is a non-systemic herbicide capable of biodegrading in the soil. It is characterized with low-water solubility, which is helpful in reducing leaching. Trifluralin is a proven root control product that has been used for over 35 years in agricultural applications. It is true that shrubs and trees significantly add beauty and value to any property. But behind this advantage is a drawback when their growing roots are factored into the equation. Consider a tree that is planted and growing close to a sidewalk, roadway or building. These are areas that are well-watered, making it likely for the roots to seek more moisture and air due to their rapid growth. As time progresses, there is a huge possibility for the roots to continuously grow up to the surface. This is what causes the cracks and damages seen on concrete and other hard surfaces. The root control system is designed to prevent this damage from occurring. The fabric can be installed vertically to provide protection to adjacent structures. Tree roots are also capable of growing into levees and dams’ mechanisms, which increases the risk of damaging the equipment causing failure. In this case, the system is installed to ensure and strengthen the integrity of the levees or dams from roots while allowing shrubs and trees to beautify the surrounding areas. The fabric can be installed inside a larger pot to help roots from growing through the drain holes and attaching to the soil. Containing the roots within the pot using this martial helps in eliminating root damage caused when having to separate the potted plant form it's roots in the ground below. The system is commonly used along retaining walls, buildings, foundations, swimming pools, parking lots and sidewalks. This is done to prevent roots from damaging these structures, which is guaranteed up to 15 years. In result, it also decreases the possibility of any potential liability and injury from cracking or uneven pavement. As a weed control system, it is required for the material to be installed horizontally, about 3 inches below stone or wood mulch. The system works by blocking the weeds’ growth through its featured 2-layered defense – physical and chemical. The BioBarrier Weed Control System is capable of providing 10 years of protection against weed growth. With such protection, weeds become unable to cultivate a strong root system while it helps shrub roots and ornamental tree to expand unimpeded. These includes around street signs, highway guardrails and utility substations where it functions to control growing weeds. Aside from preventing the occurrence of injury, installation of BioBarrier in these places also help in reducing maintenance while improving the overall appearance. These are areas which are richly fertilized and well-watered, which provides an ideal place for weeds to grow. The strategic installation of the root control material greatly helps in inhibiting the growth of weeds. Weeds growing around trees prevent them from obtaining its need nutrition and water. One common method that property owners use to prevent that from happening is the use of mulch. This practice does solve the problem, but may also result to damaging the tree trunks when used too much. 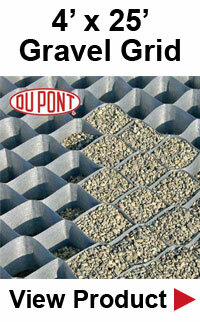 With BioBarrier, weed growth is not only inhibited, but the use of mulch is also reduced.